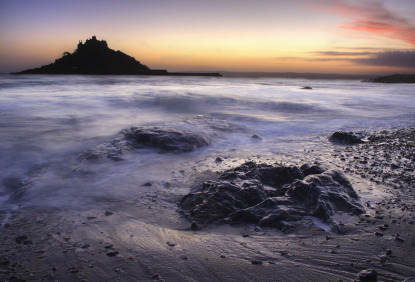 Just 3km east of Penzance as the crow flies, St Michael’s Mount is a rocky outcrop surmounted by a 12th-century castle, that becomes an island at high tide. Constructed by the same monks who built the world-famous Mont St Michel off the coast of Normandy, this Cornish version started as a Benedictine priory around 1070. In 1659 the St Aubyn family converted the castle and priory into a private house. The interior has a splendid rococo Gothic drawing room as well as an armoury. There are views toward Land's End and the Lizard from the 14th-century priory church. The castle is open between 31 March and 31 October, from 10:30am to 5:30pm (last entry 4:45pm). It is closed on Saturdays, except in summer. Admission £5.20 for adults and £2.60 for children. Allow enough time for travel from the mainland. St Michael’s Mount is located in Mount's Bay, just off Marazion. 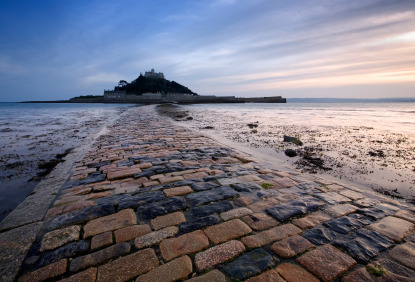 At low tide, St Michael's Mount is accessible on foot (take good walking shoes) over the causeway from Marazion. At high tide there is a ferry (£1) in summer when weather permits. Marazion is on the A394 between Penzance and Helston. Buses First 2/A/B, X7 (Penzance-Helston), No 17, 301, 317 (Penzance-St Ives), No3 (Penzance-Camborne) all stops there.